Hillary Chybinski: something done today . . .
something done today . 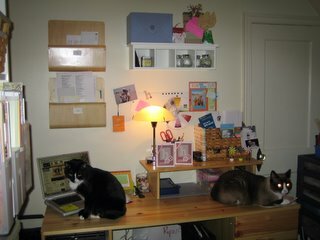 . .
. . .I re-organized the desk in my scrap space (what I am trying to get everyone to refer to as my scrap studio!). not sure if the riser/shelf thingy will work for me, it cuts down on surface space. but it did open up some space on my shelf and it looks prettier. never mind those 2 pesky kitties up there mooching the warmth from the light. . .you would think it was 40 here today instead of 70! two cards up on the shelf too that i made today - two special girlfriend birthdays this weekend.